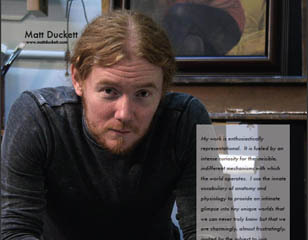 I am very fortunate to be included in the current issue of Poets and Artists magazine. It's an incredible publication, and the list of past featured artists reads like my weekly blog-stalking list. It includes artists like Michael Klein, David Kassan, Tony Pro, Jeremy Geddes, Brad Kunkle and soooo many more. You can check out the online version or order a print one, if you're so inclined. There's a ton of art and poetry in there beyond my meager contribution, and you'd be supporting a top-notch, AD FREE magazine. Didi really does an admirable job putting this magazine together. Well we had a GREAT time in NY. Much better than I could have even hoped for. We met some really great people there (despite Vernil's warnings!) and really fell in love with the city, like everyone else that has been, I'm sure. We got to see some music at the famous Birdland jazz club, which was an amazing experience. Thanks to Vernil for inviting us. Our food there was like two sculptures. Some of the prettiest food I have ever seen. We also saw a great Irish traditional session at the Landmark Tavern, complete with authentic Appalachian songs...via some Swedes. Of course the art was unbelievable. We got to see the legendary Arcadia Gallery, where so many of my heroes are represented. That place just reeks of artistic brilliance. I can only hope I brought some of the stink home with me! We even met the owner, Steve, who is every bit as genuinely nice as his artists' blogs claim he is. As for the Salmagundi Club, it was such an honor to be a part of something of that caliber. Truly humbling, and incredibly inspiring. The reception was a great time. I feel like I didn't even talk to anyone, since it was so packed. I'll post pictures soon. Thanks to everyone for the well-wishing before we left...it must have worked because we had such a great time!